I was met from the train by Mr S & Walter and we took a nice walk home. We were going to pop to Doncaster’s No.1 dog friendly pub but the sun was out and there were no seats outside so it wasn’t worth it. We were starving anyway. Pop the flour in a bowl along with a pinch of salt. Make a well in the centre and crack in the egg. Whisk up and gradually add the milk. Leave to one side whilst you cook the leeks. Add a little oil and butter to a frying pan and once the butter has melted, add the leeks. Cook the leeks gently until well softened and starting to colour. Season and set aside. Wipe out the pan. Add half of the melted butter to the crêpe mixture and the rest into the frying pan. Heat then add a ladle full of the mixture, swirl around the pan and cook the crêpes, turning half way through. Repeat until you have your desired number of crêpes. 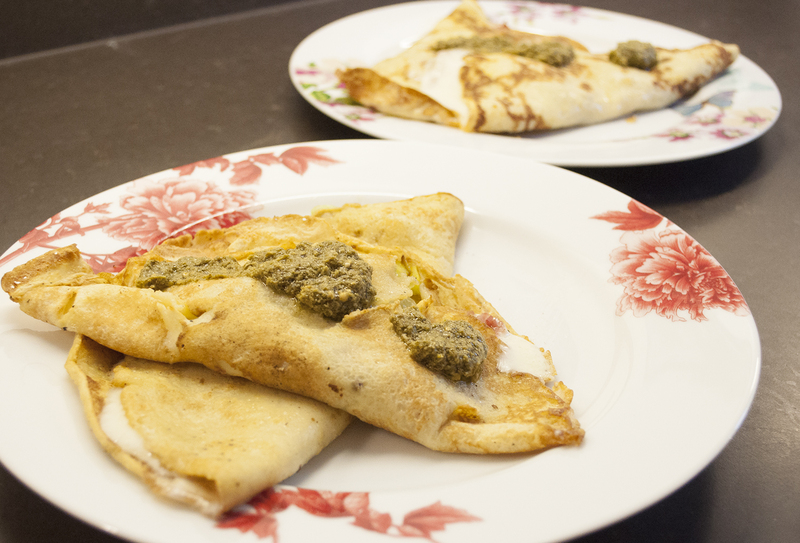 Pop some of the leek mixture over one half of the crêpes, scatter over the ham then a couple of slices of the cheese. Folder over then place on a baking tray and cook for five minutes. Serve with a little of the pesto on top. These (using roasted baby leeks) can be found on the M & S cooking app and are well worth a make. Taleggio is one of my favourite cheeses, I love it. On Friday we had jacket potato with cheese and beans. Probably the largest potato I’ve ever seen in my life. Not very ‘Friday’ but I wasn’t letting the potatoes go to waste.